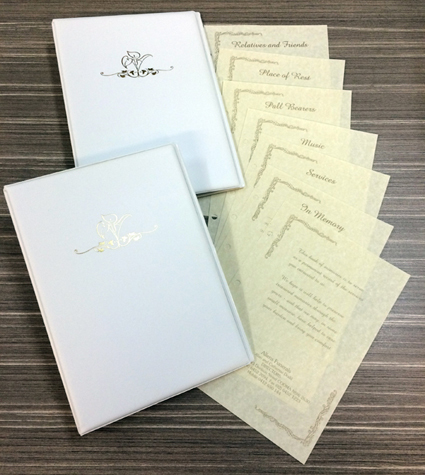 Our funeral guest book folders are made from a durable PVC with a ring binder. They come in a range of colours. Your logo can be printed on the front in any colour or in gold or silver. The internal pages are pre-printed and you simply print all the relevant information onto them. We are happy to setup a template in Word to make this process as simple as possible. A range of papers are available for the internal pages. You can order the folders in lots of 100, 250 or 500 and above.